Today I made a conscious effort to have a total vegan day. Maybe I have eaten vegan at other times by happenstance. Today I decided to keep my diet plant based. For breakfast I had peanut butter on toast. For lunch I had hummus, tabbouleh, and salad with pita. Now I just needed to keep it going. I saw a recipe on the New York Times cooking site that I thought would be tasty and could be adapted to be vegan and decided to give it a try. This recipe, I thought, would work well in case John wanted to put some sausage in it. The original recipe called for red lentils and some chicken stock. I used brown lentils and water. I bulked up the the vegetables and as it turned out John was okay with no meat. 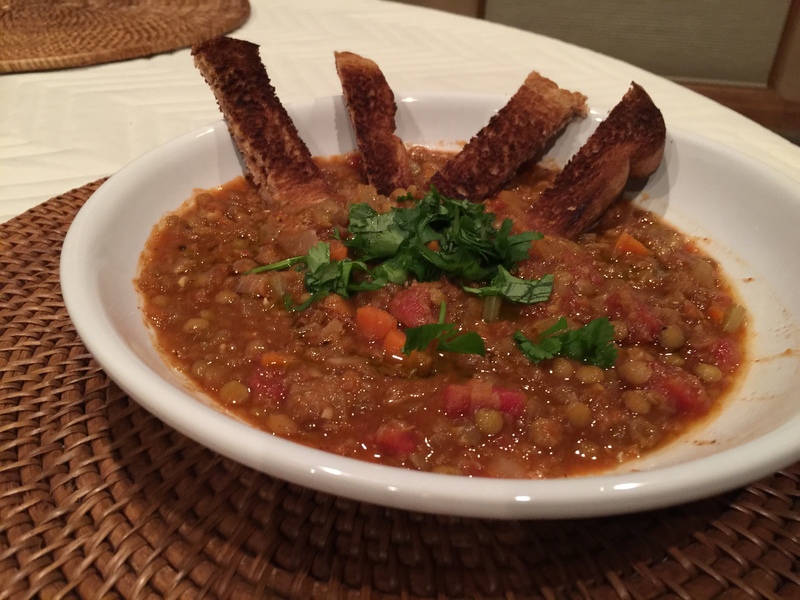 Here’s the original recipe – http://cooking.nytimes.com/recipes/1016062-red-lentil-soup-with-lemon. Aothough I am more of carnivore and probably definitely more of vegetarian than a vegan, I enjoyed my day and think it would be good to incorporate one of these days into each week. This entry was posted in Legumes, Vegan, Vegetables, Vegetarian and tagged carrots, Celery, cilantro, garlic, lemon, lentils, Onions, tomatoes. Bookmark the permalink.